I seem to have a certain fondness for British Isles literature, art, music and history. After scrimping and saving for months towards our vacation fund, last year my husband and I took a trip to explore the Highlands of Scotland. Our home base for the week was the city of Inverness, the capital of the Highlands. 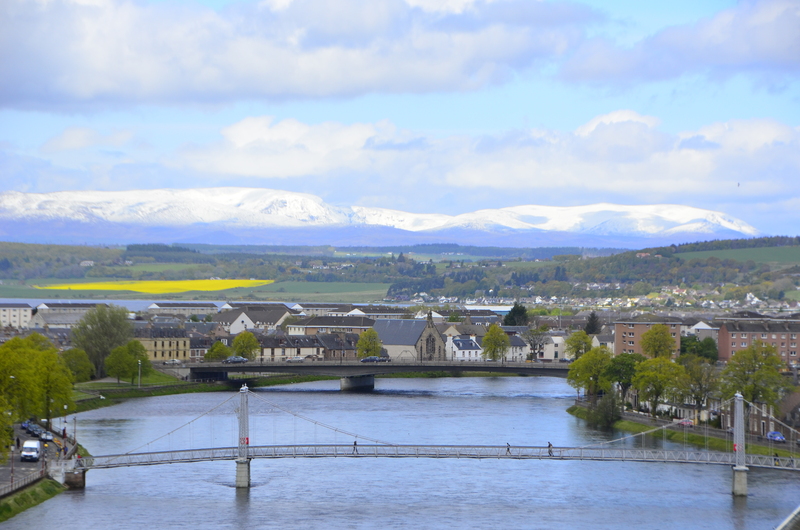 Inverness lies at the top of the Great Glen and along the banks of the River Ness. View of the Scottish Highlands from Inverness. Renting a car for the week for day trips, Bob and I drove east out of Inverness towards the city of Elgin. Along the way we saw some people fishing so we pulled over along the bank of the River Spey, near Fochabers. The fishermen were Spey casting, a type of two-handed casting with a very long fly rod for salmon fishing. 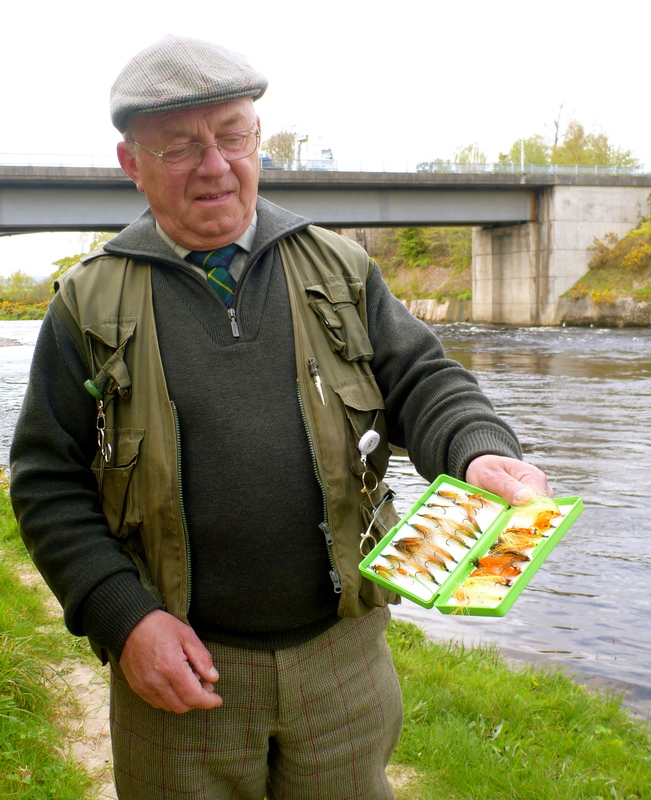 We chatted with the Gillie in attendance, and he happily showed us his collection of flies. Although very lovely, I was actually more smitten with his apparel than the colorful salmon flies. His outfit, beautiful tweed breeks, tweed cap and a tartan neck tie was something you’d probably never see someone in the United States wearing while guiding a fishing trip. 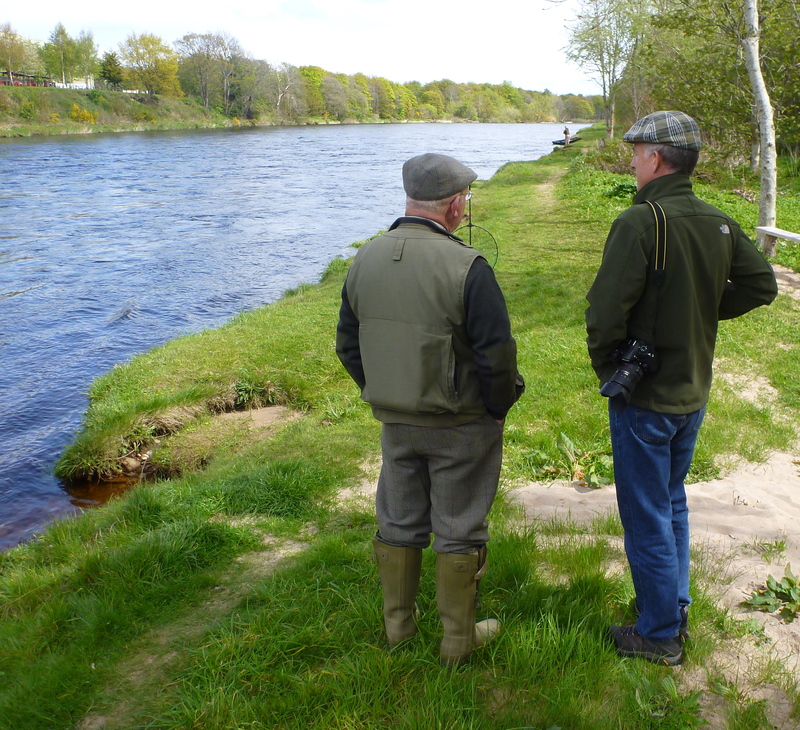 Bob chatting with the gillie along the banks of the River Spey. Back to Inverness after driving around the countryside, we took a walking tour around the city. Near Castle Inverness, we wandered into J. Graham & Co. 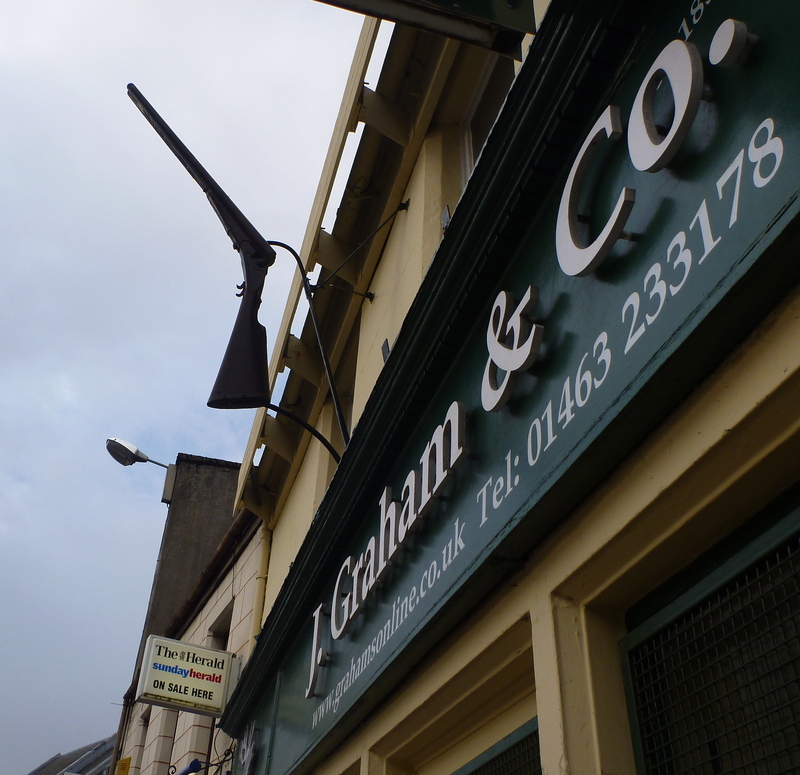 Established in 1857, Graham’s is one of Scotland’s oldest stores for hunting and fishing. While browsing around the store, I checked out their line of women’s hunting and fishing clothing and was immediately drawn to the wool tweed Alan Paine shooting jackets. Just trying one on for fun, with no intention of buying it since while out bird hunting I’m only packing a camera, my husband talked me into buying one. I’m not accustomed to making any purchases without extensive research, but the unseasonably damp, cold Scottish weather (May is supposed to be the nicest month of the year there) and having not properly packed the warm enough clothes for the trip, I gave in and bought one. 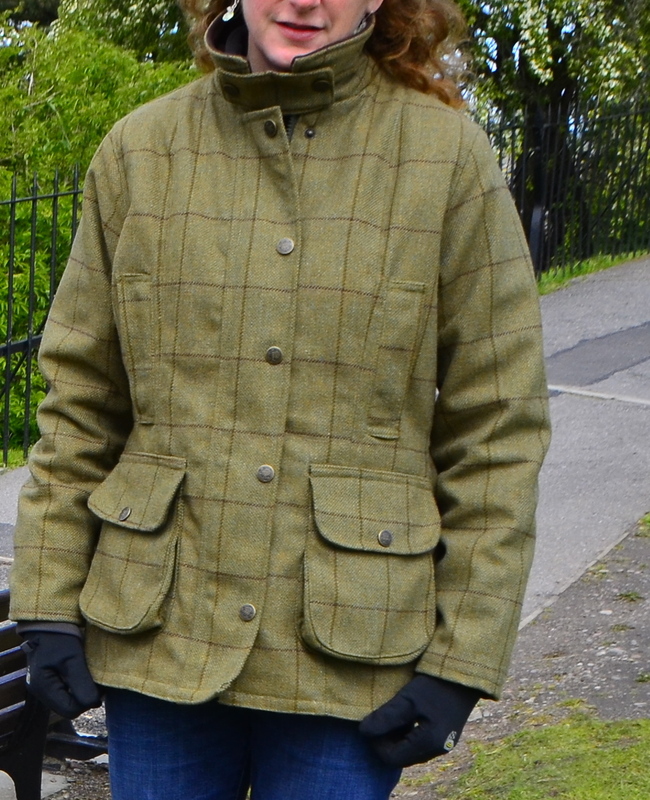 Alan Paine, lichen colored tweed Rutland shooting jacket. After returning home from vacation, I researched Alan Paine clothing. 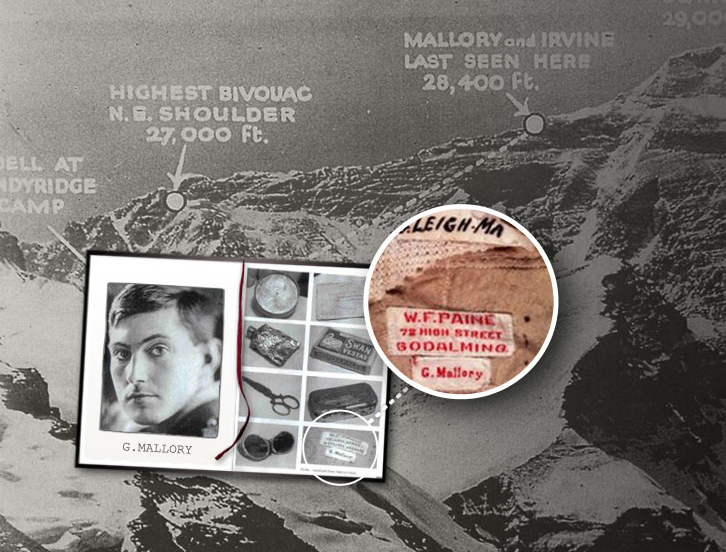 I discovered it was a Paine garment that George Mallory, the English mountaineer, was wearing when he disappeared somewhere high on Mt. Everest in 1924. When his body was discovered in 1999, his clothing tag immediately helped to ID his remains. Fascinated by George Mallory years ago, I loved this historic connection. The label W.F. Paine was Alan Paine’s father and founder of the business in 1907 (Alan Paine photo). Alan Paine country collection (Alan Paine photo). 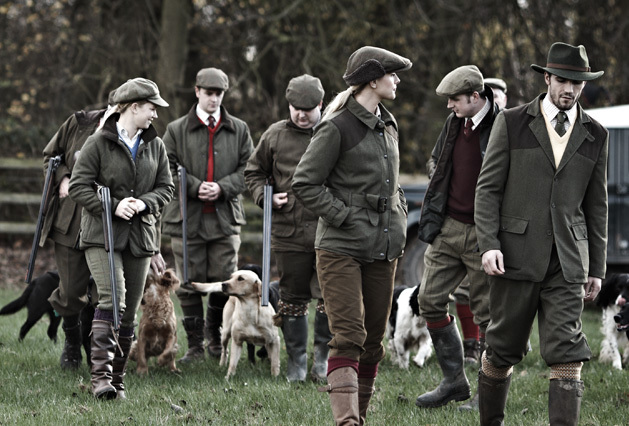 In the British Isles, hunting and fishing is mostly for the well connected or very rich because most of the land and river banks are private and owned by huge estates. I admire some of the old traditions of hunting and fishing in Britain, but on the other hand, feel very fortunate to have access to millions of acres of public lands and river banks open to everyone for hunting and fishing here in the United States. 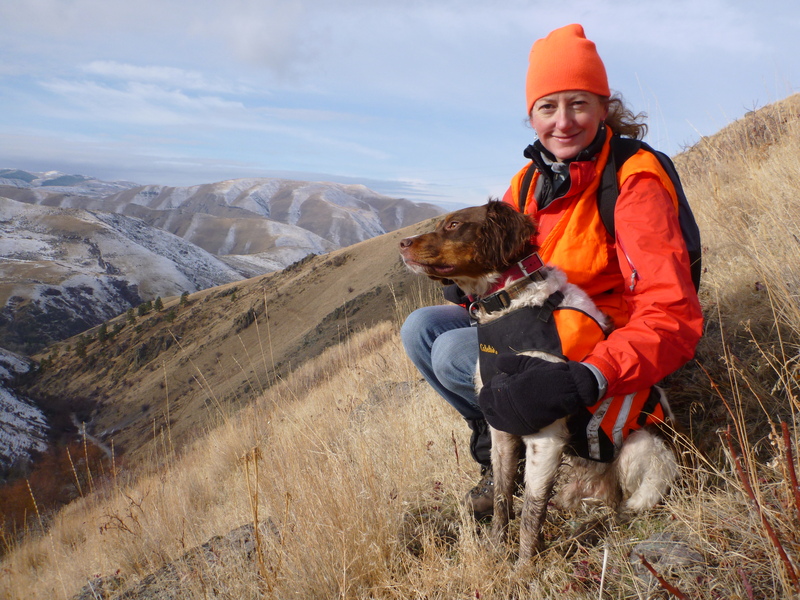 I didn’t wear my new shooting jacket hunting this season, back home in Idaho. Hunter orange is our tradition, especially when some big game seasons coincide with bird hunting season. Sure, hunter orange isn’t my favorite color or as fashionable like my new lichen colored tweed shooting jacket, but at least I’ll be seen by the other hunters. Tagging along bird hunting with Angus.